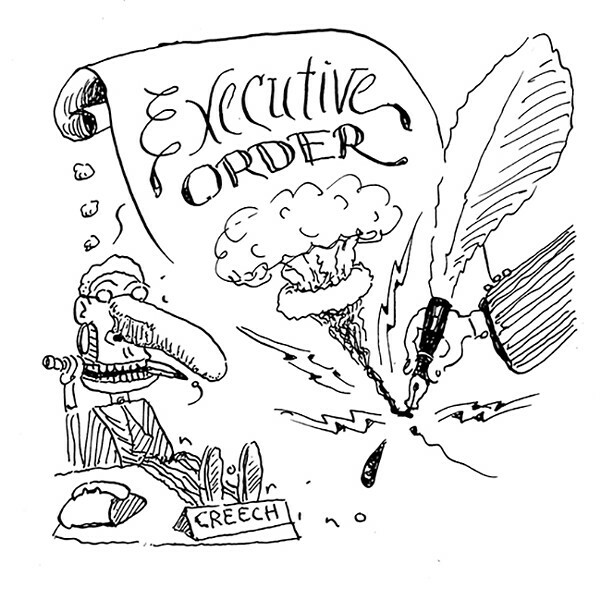 How powerful are presidential executive orders? If you're looking for a silver lining to this storm cloud of a presidency, well, at least we're getting an intensive refresher course in civics. As scary as it might seem in the wrong hands, an executive order is nothing more than a U.S. president's directive to the departments he oversees, instructing his subordinates in how to go about their business. Every president has issued at least one of them, except poor old William Henry Harrison, who never got a chance. Probably the most famous of them all came from the pen of Abe Lincoln: a little number called the Emancipation Proclamation. Lincoln, in fact, also issued executive order No. 1, though putting it that way is a bit misleading. The State Department didn't start officially numbering the orders till 1907, beginning retroactively in 1862 with the oldest they then had on file, one granting parole to wartime political prisoners—some of whom had been taken into custody following the most controversial act of Lincoln's presidency, the executive order suspending habeas corpus that allowed the military to imprison suspected traitors without review. An executive order is how Roosevelt ordered the internment of Japanese-Americans during WWII, how Truman integrated the armed forces afterward, and how Eisenhower sent troops to Little Rock to integrate the schools. As direct and functional as an executive order can be, its legal nature is surprisingly fuzzy. There's no explicit constitutional authorization for an EO, though it's hard to imagine presidents acting without something like it at their disposal. An EO isn't a law, because only Congress can pass those, but it has the force of law—at least unless and until Congress decides to pass a law to counteract it, or the courts say it's not kosher. After Harry Truman issued an order attempting to establish federal control of steel mills during the Korean War, the Supreme Court blocked his move, creating in the process a framework for evaluating when such orders were permissible. Effectively, the president's executive power is reciprocal to congressional initiative: Where Congress has said nothing about an issue, executive power is at its height; where it's given pretty clear instructions, a president's hands are largely tied. Because presidential power is so poorly defined, it's easy for opponents to paint the issuing of high-profile orders as undemocratic power grabs. And certain orders do seem to skirt the limits of presidential power, especially, these days, in the arena of immigration. Obama's big immigration initiatives were instituted by executive order, but courts hobbled their implementation; of course, Trump's two attempts thus far at so-called "extreme vetting" measures have been even more severely curtailed. Here, at least, there seem to be effective judicial checks on any overreach. Sometimes critics will simply accuse a president of issuing too many executive orders—period. It's hard, though, to imagine any president beating the record 3,522 orders signed by FDR, which haven't seemed to mar his reputation too badly. More recently, the number of EOs has been roughly consistent from one administration to the next: of the 10 presidents before the current one, all averaged between 35 executive orders a year (Obama) and 80 (Carter). Reagan's 381 overall were the most in this group, though Carter might have topped that tally with a second term. Trump, meanwhile, signed 33 in his first 100 days—more than anyone since Truman, who had a war to wrap up. You'd figure he can't maintain a pace like that, though with this guy, who knows? Self-promotion being his bread and butter, Trump has naturally played up the theatricality of his executive-order signings, making them seem more momentous than they are. As you point out, the president can't allocate the funds necessary for his initiatives on his own, though he can direct a federal agency to use its existing budget toward a certain end—a border wall, let's say. Some of Trump's executive orders might be intended to torpedo Obama-era policies, but there are bureaucratic procedures in place that slow down changes, of course. Once a federal agency has issued a rule, for instance, it can't then just reverse itself without first undertaking a lengthy review process, no matter how ardently a new president might long to undo his predecessor's work. Even so constrained, Trump's flurry of EOs might well lead to real consequences, but, as was famously once said, elections do have those. Ultimately, the number of executive orders a president signs doesn't really tell us a lot about what the president is getting done. Much of the power of the presidency has historically been exercised through less attention-getting means, in the everyday maintenance of the government: via the writing of memoranda, for instance, or by instructing department heads to issue administrative orders of their own. This is the sort of subtlety, one suspects, that President Donald J. Trump might not be destined to grasp.